As a young mother, Selina DeLangre packed her kids in the car and took them to Disney World for a typical family vacation. When it came to snack time, though, the amusement park fare wouldn’t do. Selina and the kids retreated to the parking lot for healthy edibles out of a cooler, rather than indulging in junk food. Last May, more than 25 years later, Selina returned to the Orlando park, but this time she brought her health food on the grounds. 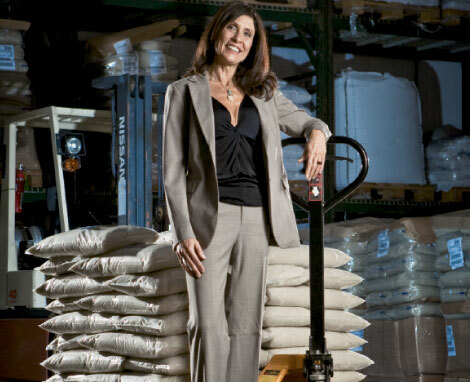 As CEO and owner of Selina Naturally, the Arden company that produces Celtic Sea Salt, Selina participated in the Downtown Disney Festival of Food and Wine, where her nutrient-rich salt was on the menu at several restaurants and sold at a kiosk. From the parking lot to Main Street Disney, Selina Naturally and its CEO have come a long way since she started with the company 30 years ago. Selina’s father-in-law, Jacques DeLangre, founded the company, then called the Grain and Salt Society, in 1976 in Chino, California. A pioneer in macrobiotics—a dietary program that stresses unprocessed foods and healthy eating—Jacques exported the company’s main product, Celtic Sea Salt, from France’s Brittany region. He named his brand after the seafaring people who once inhabited this area along the English Channel. Harvested from ancient coastal flats, the salt has been farmed for centuries using the same method. An aerial view of the region reveals a labyrinth of interlocking ponds, each veined by thin swathes of earth. Sea water is channeled through the ponds as it distills, and salt farmers, or paludiers, rake mounds of salt onto the slim banks that border each pool. According to the company, this labor-intensive process preserves the purity and balance of the ocean minerals in the salt. Unlike common table salt, which is iodized, bleached, and contains additives, Celtic Sea Salt is whole and unprocessed, allowing the body to easily absorb its nutrients. “Nothing is isolated in the assimilation of nutrients,” says Selina, who makes biannual trips to the flats to ensure quality. Selina began building relationships with the salt farmers in 1979, after marrying Jacques’ son, Philippe, and joining the company. Under the family’s tutelage, she became an instant convert to healthy eating. “I was introduced to macrobiotics by my in-laws at the age of 19, and I absorbed it like a sponge because it worked so well for me,” she says. Personal factors played a role in her quick conversion to the new diet: As a teenager, she suffered debilitating migraines, which the new dietary regimen worked to assuage. She also had a son, born the same year she started with the company, afflicted by cerebral palsy, and macrobiotics provided a complement to traditional treatments. Selina bought out her husband’s share when they divorced in 1999. After taking the reins, she added salts from Portugal and Hawaii and introduced a slew of healthy lifestyle merchandise from bath soaps made with salt to kitchenware to nut butters. In 2007, she changed the company name to Selina Naturally, a move she says reflects the broader product range. Today, thousands of retailers carry her brand, including Ingles, Whole Foods, and Greenlife Grocery stores. Still, Selina is the first to admit she lacks the traditional qualifications of a CEO. “I don’t have a business degree, but I know the power of thoughts and prayer,” Selina says. “I’ve been successful because I’ve willed it to happen.” The road to success hasn’t always been a smooth one, though. Personal and professional trials have also marked the way; in one incident, the company was almost lost when its offices were flooded during torrential rains in 2000, and Selina had to weather the death of her son several years ago. J. Hansbrough is a freelance writer living in Asheville.